Be it democracy or dictatorship, its the ruler who writes the history and describes the truth. To ensure long life on the chair, it is essential to control the flow of information to the inhabitants of the land, announce the niceties and bury the misdeeds. It was easiest in the times of no media, just destroy the mind which holds the defaming phrases. Even with press and television, it was not much difficult as they had to operate from the land and the authorities could locate them and strangulate them without much twist in the wrist. But with the advent of Internet, things changed a bit. It was all virtual. One need not be in a country to operate and do business there. Freedom, as it has been defined in books, was actually taking its meaning now. But the ruler is a ruler only when it can suppress the voices raised against it and it had to control what is being said. Hence, the information on the Internet too is regulated and fine tuned to suit the taste of government. Internet companies have been receiving requests (actually orders) to block public information and reveal private information about users. All in the "national interest" they say! Google has come out with a nice initiative to publicize the info about such requests. Its called Government Requests. They document how many such requests were received by them from which country. A crude general rule to comprehend this tool would be - more the number of requests from a country, less the freedom there. A. "Removal Requests" which means "we don't want X info to be known by public, remove it." India stands third for "removal requests" after Brazil and Germany with 142 such requests. 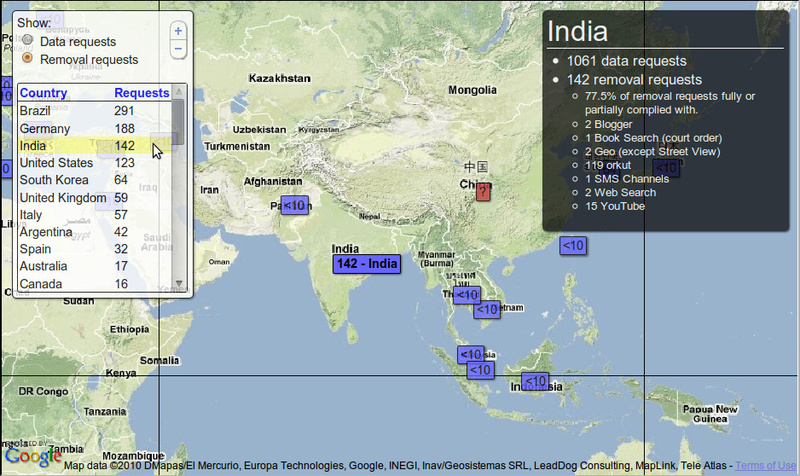 For "data requests," India secured fourth position after Brazil, United States, and United Kingdom. India seems to be doing good in keeping info out of public eye even as Internet penetration remains dismal. By the way, there is no info about how much public info China wanted to hide and how private info it wanted to secure. So, all the while we have been believing that "Internet" is the fodder for the animal called "Freedom." True to great extent. But true also it is that this animal, "Freedom," is a chained pet of the rulers. Hopefully, chains will be broken someday with efforts of individuals and corporates with a vision, like Google. Indeed, Google's dedication to transparency and open source is really laudable.